After over a decade of doling out penalties, Google has caused the rise and demise of manipulative SEO methods. Many professionals have nearly forgotten the broad space for manipulation enabled by on-page SEO, and are acting on a very basic level, be it as a result of added caution or perhaps habit. No, this isn’t another article about title optimization, keyword optimization, and the importance of tags. Below, I intend to present a list of problems and solutions that will help you improve search engine rankings using on-page elements from less talked about, yet still significant, angles. To draw a parallel, envision your site as a brick and mortar store. Your off-page SEO would be equivalent to reputation management and PR efforts, while on-page is more about what your store contains: the shelves, the cash register, etc. 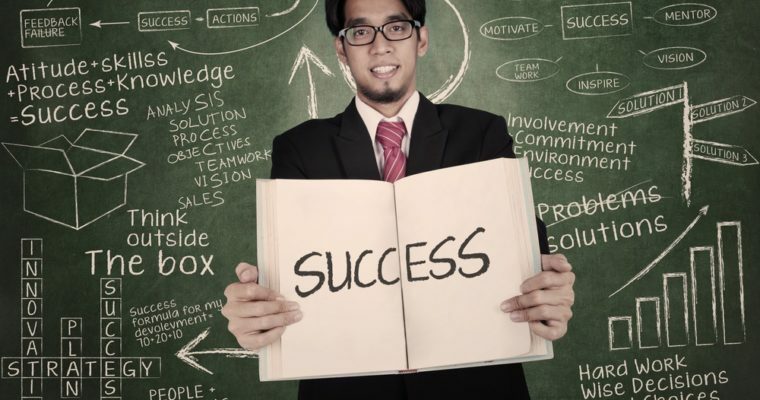 Each element varies in importance, but all are crucial to the store’s success. 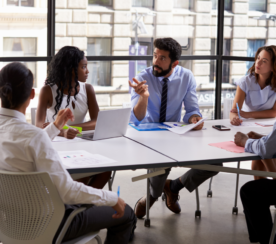 Often, business owners insist on getting quotes for off-page work only, usually content-based, without performing any on-page changes. They may feel extremely confident in their conviction that they’ve done all that could be, but the reality is often very different. A quick analysis typically yields unprofessional and/or non-SEO compatible coding and insertion, which can damage rankings. 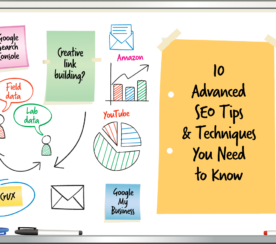 Advanced implementation of on-page SEO techniques strengthens the site and can have a quick, almost immediate effect on rankings, unlike off-page efforts which usually take longer to bear fruit and are conditioned upon many factors we cannot control. After nearly 10 years of experience in the field, I’ve stumbled across a lot of strange situations and interesting facts. In this article I’ll round up a few key tips for effective on-page optimization. 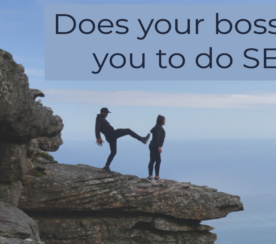 As you might deduce from the title, this piece is intended for somewhat experienced SEO professionals, so I’ve made certain assumptions about base knowledge and technical ability. If anything is unclear, feel free to ask me questions in the comments section. The following list of on-page methods is ordered randomly, and not according to significance. Take a deep breath, and let’s dive in. Editor’s Note: the author claims no affiliations to the mentioned tools in this post. General Explanation: have you ever wondered why sub-pages such as “About” and “Contact Us” typically have strong PR and DA scores? In many cases, they don’t even have external links. The reason for this is internal links: these sub-pages usually appear in cross-website menus. 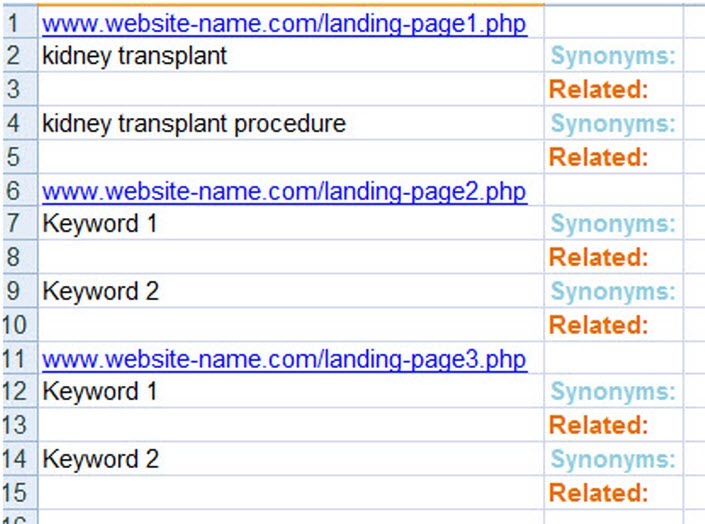 By linking to these pages internally at a higher frequency, we’re effectively declaring them important. However, they may not be as strong as they could be. Crawling robots don’t have preferences or desires; their mission is simple and calculated. For this reason, if we know exactly what they’re after, we’ll be able to optimize our site. When a site is being crawled, movement from one page to the next is done by entering these internal links. Information is collected until the crawl is finished, or if it reaches a “time out” notification. In most cases, sites are looking at a large squandered opportunity. Improving the structure of your internal links is one of the most effective ways to optimize your on-page elements. Nearly every time, once this is done we see an improvement in rankings upon Google’s next crawl. The method for optimizing this structure is widely known: anchors tell stories. If we take all the anchors on a given site and write them out only to read them consecutively, we should hope to get a picture of the site’s theme. The Problem: Without a clear internal links structure, Google’s algorithm assigns less relevant search phrases to the site’s most important landing pages. The primary symptom of this is having the homepage attributed to most of the phrases we want to rank high for, but few of them make it to the top of SERPs. The Solution: If your site has a blog, start out by linking 20-30 posts (don’t overdo it) to relevant, important landing pages. Write an additional 15-20 new posts per month delving deeper into the main subject dealt with in the landing page, and link from these new posts to the older posts, and vice versa. 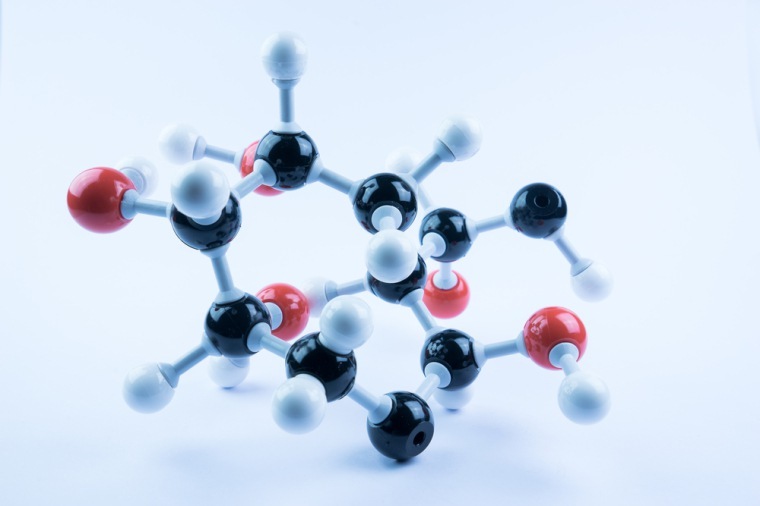 This internal linking system should highlight the main crossroads in your site, using both old, indexed pages, and newer pages. Ensure your content is interesting and of high quality. Otherwise, your internal links won’t cut it. Note that I didn’t mention which anchors it’s preferable to use, since that’s less important, as long as the page it’s linking from is relevant. Naturally, it’s advisable to use anchors that describe the target page. “Click here” is also a popular anchor and even recommended every now and then, when appropriate. The outcome should present all the pages in the site. Now, we’ll check strength and popularity in two simple steps. True, PR isn’t the most reliable or accurate measure to assess strength, but it still serves as a good indicator. Naturally, testing PA (page authority) would be more accurate, but it would require setting up an account with Moz and registering an API code. Note: Those of you who’ve used Moz’s code in the past know it can sometimes be inaccurate, and sometimes return absolutely no outputs. Pay attention and check every suspicious result manually. It’s important to remember that these metrics don’t necessarily assign the same importance that the algorithm assigns to them, but they’re sufficient as a general indication. General Explanation: This is likely one of the most overlooked elements on your site. Metaphorically, it’s the dark attic no one thinks about during their regular routine. However, when considering that Google crawls your website for only a few seconds – maximizing said crawl time could be significant. Though these files are no longer in use, they are considered whenever your site is crawled, which could be preventing you from maximizing the resources allocated to you, or worse: diluting the important information found of the site. General Description: Are penalties issued for duplicate content? Hardly, except in extreme cases. Generally speaking, duplicate content by itself is not sufficient grounds for a penalty, excluding cases where Google recognizes fraudulent intent behind said duplicate content, aimed at ‘tricking’ the search engine. Usually, duplicate content will lead to devaluation, and most of the time, we won’t even realize it. Every search result contains thousands of indexed results; Google gives us access to the first 1,000, meaning 100 pages, of search results. Nearly no one is interested in what page 10+ has to offer, due to the simple fact that we’re accustomed to believe that whatever is on the first page of search results is more relevant and thus more reliable. It’s almost second nature to trust Google’s algorithm, and they in turn do everything to avoid disappointing us. Duplicate or similar content poses quite a challenge to Google, in this respect, and therefore Google is determined to face it head on to avoid compromising user experience. Once more, those first 1,000 results are essentially a long chronological list sorted by relevance and authority. However, this list is also subjected to filters intended to keep quality high. As you may have guessed, one of these filters is set to recognize duplicate and similar content. What is the Problem? Like a ball and chain, duplicate or similar content weighs your site down, and makes all work on the site harder. Theoretically, a duplicated page could eventually make its way to the first page of search results, provided other ranking factors leverage its strength over competitors, despite the duplicate content. This effort, however, will be much greater in terms of time and money. The Solution: I’ll touch upon each individual problem, and describe its solution thereafter. You have: Written the main site’s URL in several ways. For example: with or without www prefix, with/without index.php suffix, etc. All of these versions lead to the same page – your homepage – and they may all be indexed by Google. You have: Duplicate titles and page descriptions. Google serves you this data on a silver platter, and therefore expects you to do something about it. Solution: Access Google Webmaster Tools, get rid of the duplicates, and while you’re at it re-examine the rest of the recommendations that appear. You have: Internal pages with parameters. 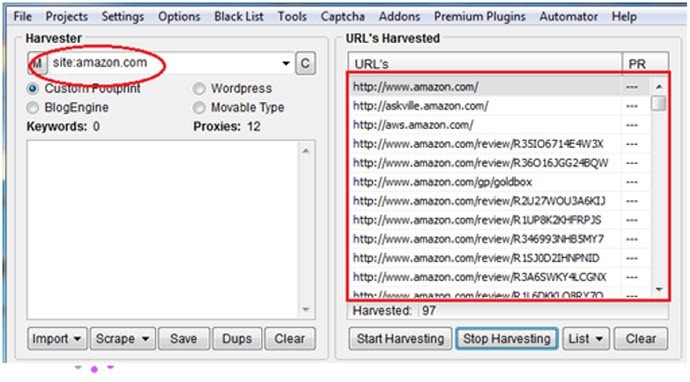 Many sites use different URL versions in order to track and analyze. Additionally, there are varied reasons due to which pages might receive different URLs, whilst all lead to the same page. In these cases, Google meets us halfway and offers an easy-to-use tool under Webmaster Tools. Define parameters which Google will use to determine, ahead of time, whether duplicate content is present, and treat said addresses accordingly. You can find more on this subject in this post by Google. It’s best to define the parameters in advance, since once they’re indexed it’ll take some time before Google gets rid of them completely. Search for duplicate content using CopyScape and handle accordingly. Reduce similar content by unifying similar pages. When possible, opt to create longer, thorough pages which cover an entire topic rather than separate pages for sub-topics. If you’ve decided to do this using existing content pages, don’t forget to set a permanent redirect from the cancelled page to the updated page which should now include more comprehensive information on the subject. General Description: In the eyes of Google, providing a great user experience is synonymous with increasing accessibility to information – helping users find precisely what they want as quickly as possible. The less time you spend in each search session, the better. When it comes to your site, the opposite is true: you need to retain your visitors for as long as possible (excluding key phrases having to do with addresses, telephone numbers and other fast-info). Site loading speed is one of the most important user experience metrics. If your site loading speed is average or slower, you’re probably paying the price for it with higher bounce rates. Google notices this, tracks you, and ‘penalizes’ you in rankings. What’s the Problem? There are different ways to measure user experience, one of which is site loading speed on PC and mobile devices. A slow loading site will be subject to penalty. As early as 2011, Matt Cutts stated that site loading speed is one of the factors that factor into ranking, and as time goes by we’re inclined to believe the importance of this factor has increased. Three years after said statement, I can say with confidence that improving site loading speed nearly always improves rankings. The Solution: First and foremost, assess your site’s current state. I always prefer to use the tools provided by Google, since they’re adapted to the actual measures they examine. The following example uses two tools in order to get a broad assessment of the problem, and resolve it. 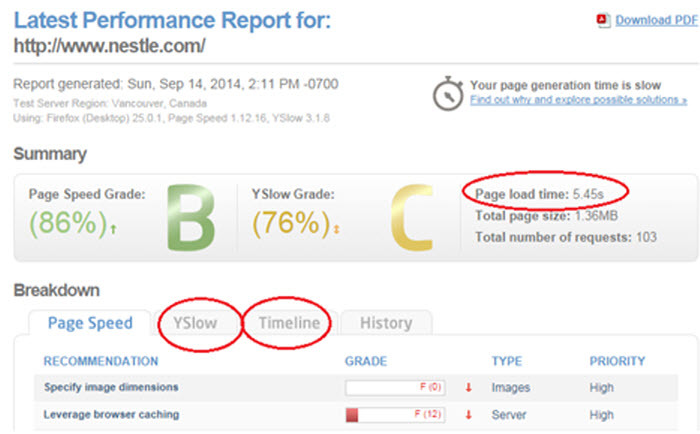 PageSpeed Insights scores sites according to loading speed, from 0 (slowest) to 100 (fastest). Google scores itself at 99, and I recommend aiming for a site loading speed of 70 and above. Every score range is assigned a different color; try to aim for the yellow area in the very least. 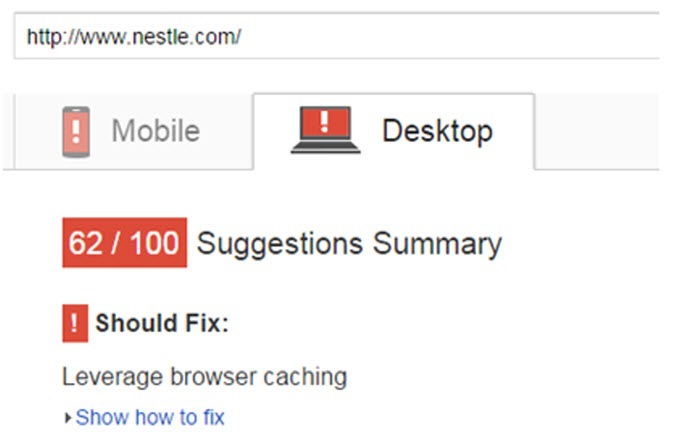 After conducting the test, you’ll also receive recommendations for changes you can implement on your site to improve your score. For a quick fix that deals less with the code, start with the next four recommendations and then regroup according to the results yielded by the two tools recommended above. Optimize all the images on your site (access from your main image directory). The simplest tool you can use to do this is Yahoo! Smush.it. Use a CDN (content providing network). This is a service typically provided by your site storage provider. General Explanation: Blocking certain files and code elements may force Google into assumptions that hurt us. Google can’t know everything about your site, nor can it examine everything manually. Therefore, it’s important to be cautious and not produce artificial warning signs. What’s the Problem? The presence of blocked files on the site makes Google err on the side of caution and deem our site malicious, even if it hasn’t been proven manipulative. Solution: Go over the checklist below and make sure you’re not giving off warning signs unintentionally. Be careful not to block template files as well (which, by the way, also block JS and CSS). This is a common mistake many think helps Google navigate to content files instead of code files, but it’s simply wrong. WordPress site owners can and should block their Plugins directory. Though Google can only decipher (‘read’) text, the presence of images is just as important. Don’t spare Google from crawling your image directory. Blocking this directory will render all your image files unindexed, which will in turn decrease the amount of content classified under your site. There’s no direct evidence pointing to this influencing rankings, but it should result in an increase to incoming traffic thanks to Google’s Image search results. If there’s no justification for blocking media files, I’d strongly advise against it. 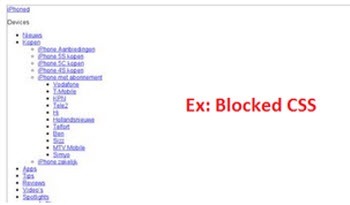 Avoid blocking your RSS Feed directory. This is an important source of information for Google (and for you, depending how you look at it), even more than your site map. 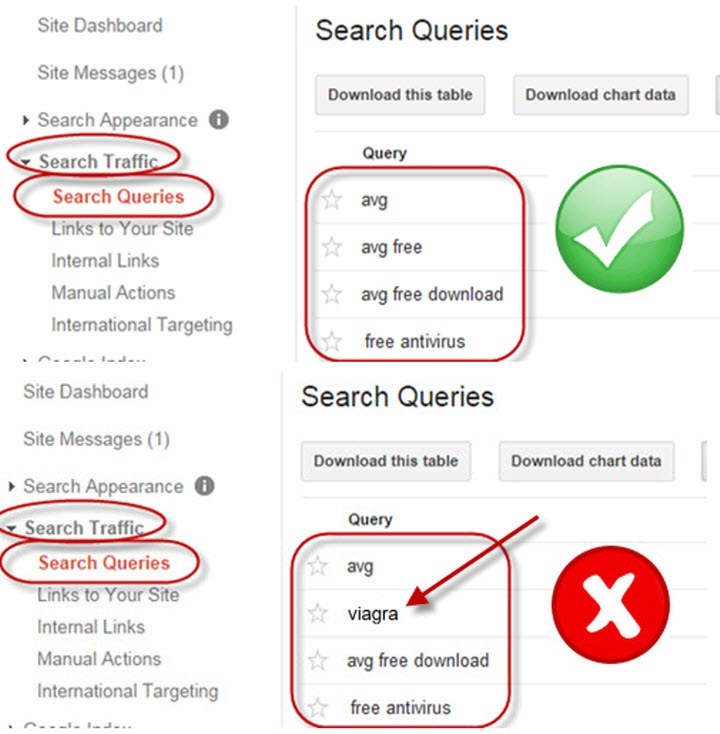 Once a month, I recommend checking the list of search queries in Google Webmaster Tools. There, you’ll be able to see the traffic your website gets from keywords that have nothing to do with your site. Ensure that your site is getting traffic only from search terms having to do with your field of activity. Words which should raise a red flag are those related to adult-content, medical supplies, and loans (assuming your site doesn’t deal with these subjects). In checking this you’ll be able to determine with greater confidence whether or not your site has been hacked and inserted with pages preying on its strength for black-hat SEO purposes. 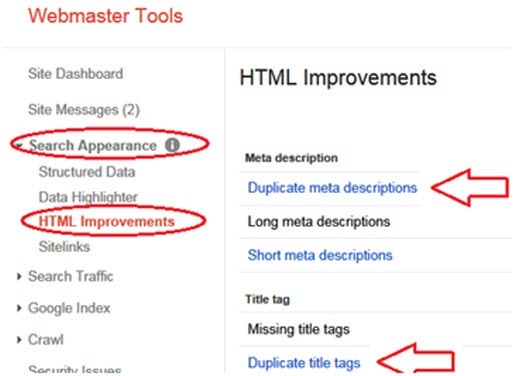 Check Google Webmaster Tools under the tab Security Issues. Running a cross-site search can be conducted using DreamWeaver or similar software. Prior to this, remember to back-up your entire site on a local directory, an action you should ideally take every several weeks (in addition to the back-up services offered by your website storage provided). NOTE: treat every suspicious result seriously, but don’t jump to the conclusion that you’re dealing with malicious code. General Explanation: Ongoing maintenance includes running periodical scans, in order to ensure optimal user experience. Google understands internet dynamics, and is well aware of the incompleteness that characterizes almost every site out there. Therefore, there’s no danger of penalty due to a few broken links, but you should definitely do something about them if they’re so common they send a message of neglect. 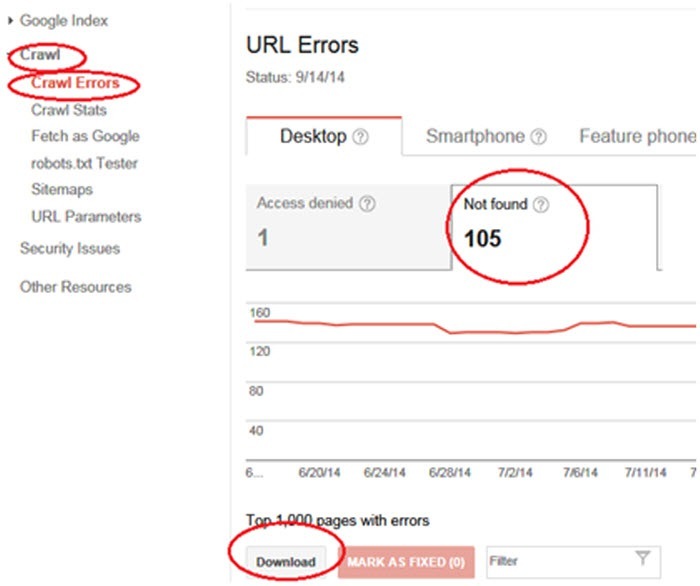 There’s no exact number, but if you’re dealing with hundreds of broken links appearing in Google Webmaster Tools, or if you’re seeing a constant rise in crawling problems instead of a decrease, it’s cause for concern. Again, I recommend using the data provided by Google to try to restore the natural balance. What’s the Problem: Broken links damage user experience, and in extreme cases, may indicate site neglect. In the presence of broken links, we lose strength accumulated and as a result, the site’s overall strength is damaged. Typically, when we see strength compromised it’s due to lost addresses. Solution: There are two stages to solving this problem. Run a Xenu Link Sleuth test and fix all the broken links you find. 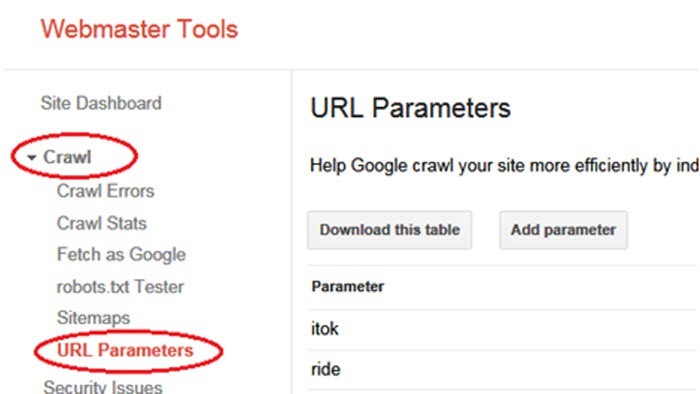 Handle the lost addresses by finding the broken addresses list in Google Webmaster Tools and exporting the data into a CSV file. Save only the URL column and delete all the rest. It’s important to know that despite the broken addresses, some may still hold value that you should strive to conserve. If you’ve never completed this process before, it’s possible that the number of URLs in the file reaches hundreds and even thousands. It can seem daunting and frustrating, but if you’re careful to maintain this periodically, it shouldn’t take more than a few minutes on an ongoing basis. Now, find the valuable URLs in the list. Delete the URLs that were fixed in the first phase. 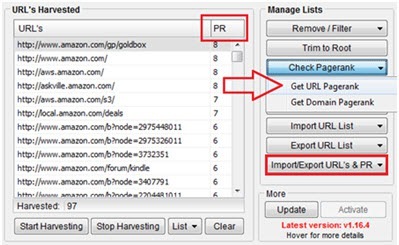 Now, highlight all the URLs you know are valuable from experience (perhaps popular old posts/pages which you decided to delete for some reason) and check PR and social strength as shown in step 2. Denote all results which have a PR of 1 and over, and those with high social signals (determine the minimum yourselves based on the data). Now, you have a list of all the valuable lost addresses along with a permanent redirect to the new URL. Copy this list and insert it into htaccess. General explanation: errors in the code, as well as superfluous code, can delay crawling and signify an unmaintained site. Like broken links, errors in the code are commonplace and natural, up to a certain degree. In most cases, the number of mistakes doesn’t reflect the level of maintenance, rather the types of mistakes and the depth of their effects. It’s entirely possible that there are 100 mistakes in your code which require no particular attention, whilst one critical error can have devastating consequences. What’s the problem? Any site that’s been around for a few years typically suffers from an inflated code filled with superfluous lines and errors. These can potentially cause instability and inefficiency, and signal to Google that the site isn’t regularly maintained. Solution: Again, a two-phase solution is necessary. General Explanation: We can’t avoid discussing keywords, but this time I’d like to approach the subject from a different angle – namely, the location of keywords in key locations, as well as using LSI (latent semantic index) are both important measures to ensure you’re getting full credit for your content. Most of us have no background in psychology, but Google invests a great deal of resources to decipher user behavior in order to yield better search results. By understanding the way users naturally scan and decipher the page, Google can further improve its algorithm. By being aware of this process, we can optimize our content to appeal to this natural user behavior, and to Google’s algorithm. What’s the Problem? Content-poor landing pages, or pages that have incorrectly structured content, typically rank low. For every keyword or phrase you choose, write down synonyms and related keywords. Synonyms are available in any thesaurus; related keywords can be found via Google. Type the word, hit the space key and then consider Google’s suggested search queries. This is a great tool to use. If after these you still haven’t found what you’re looking for, click “Search” and scroll all the way down the first page, where you’ll find a section showing related searches. Once the Excel file is ready, make modifications to the text and ensure as many words from your list appear in the landing page, naturally. Be mindful not to overstep the boundary here, since unnatural content has been on Google’s sights in recent years. The objective is to improve the level and quality of coverage on this specific topic. Avoid keyword stuffing, which will almost always expose the site to a danger of penalty. The above tips should get you well on your way to optimizing your site’s on-page aspects, after taking care of basic on-page factors you should all be relatively familiar with. However, note that no site is ever ‘finished’ – maintenance should be ongoing and frequent. Through experience, we should strive to prioritize the on-page tasks and focus on those that yield the best results. Good luck, and get to work! Got more expert tips? Sound off in the comments!